Sundays Are Spectacular At Rainbow Lodge! 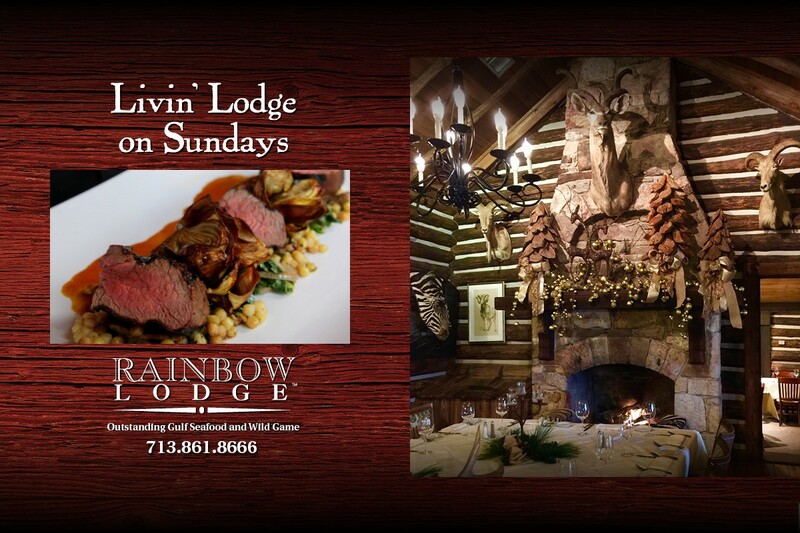 Diners are “Livin’ Lodge” at top Houston restaurant Rainbow Lodge—where Sunday is one of the best dining days of the week! It kicks off with brunch from 10:30 a.m. to 3:30 p.m. Indulge in $2 mimosas alongside Executive Chef Mark Schmidt’s menu, a mix of classic dishes and creative originals featuring smoked meats, housemade wild game sausage and the natural wealth of our own garden and beehive. 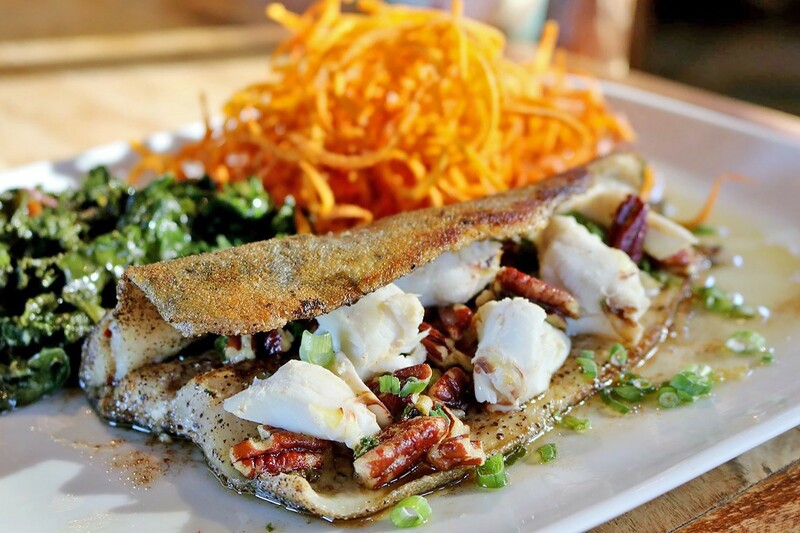 Try our Fried Texas Quail Bites on White Cheddar Grits with Bourbon Bacon Gravy or the all-time customer-favorite Slow-Smoked Duck and Andouille Sausage Gumbo with wild rice pilaf before moving on to gorgeous Crisped Rainbow Trout with Lump Crab and Pecan Brown Butter, crispy sweet potato curls and garlicky kale. More in a breakfast mood? Feast on Brioche French Toast with Caramelized Bananas, walnuts, warm maple syrup and peppered bacon. For the very hungry: try the Mixed Grill of Game Sausage, Venison & Texas Quail! With two eggs, blistered jalapeños, and our Lodge-style rösti potatoes, it will satisfy the heartiest of appetites! In addition to the great deal on mimosas, guests love beverage director Marc Borel’s list of wines from all over the world, as well as the Texas Bloody Mary with Dripping Springs Vodka and jalapeño-stuffed olives and served in a salt-and-pepper rimmed glass. Chicken piccata with capers and crisp haricot vert (French-style green beans), a recent Sunday Supper selection at Rainbow Lodge. Photo by Phaedra Cook. In the evening, savvy diners request our Sunday Supper, a remarkable, complete comfort food meal for only $15. It’s a casual, come-as-you-are evening. Of course, there has to be something wonderful to drink alongside and that’s why our wines by the glass are half-price after 5 p.m. 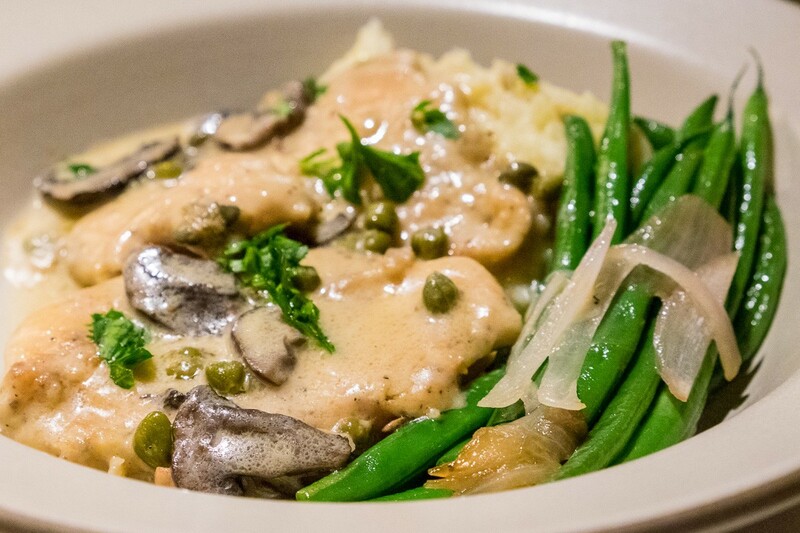 This next Sunday Supper features Chicken Piccata with two sides! Rainbow Lodge is located at 2011 Ella and is open Tuesdays through Fridays from 11:30 a.m. to 9 p.m. Saturday dinner service is from 5:30 to 10 p.m. On Sundays, “The Lodge” is open from 10:30 a.m. until 9 p.m. Call (713) 861-8666 to reserve or visit our website for more information. We hope to see you soon!